#1: What is this event about? #3: What's the agenda and speaker lineup? #4: What's the money-back guarantee? #5: If I can't attend, can I purchase the recording later? #6: What if I have to cancel last-minute? #7: Why attend in person if you offer the virtual option? What's the difference? #8: I already have the Toolkit and I'm not implementing it; what are you going to cover at Boot Camp that I don't already have? #9: I want to go but I'm broke! What do I do? #10: I don't think I can take that much time away from my business; is there another option? The IT Sales and Marketing Boot Camp is our annual, international CONVENTION where our best and brightest clients come together to share NEW business-building ideas, NEW marketing and sales strategies, NEW ways of generating profits and to get practical advice on how to overcome various roadblocks and obstacles in growing an IT services business. MANY of our members tell us that Boot Camp is an extremely inspiring event where the concepts we teach finally "click." That's because the entire event is focused on one thing: Giving you actionable, highly relevant strategies, tools and templates for generating more sales, more opportunities and more profits in your IT services business. It's also where we share multiple "how-to" sessions from our members who've had success in implementing our sales and marketing systems in their business so you can not only learn HOW they went about getting it done, but also be inspired to be more aggressive in implementing it in your IT services business. Based on paid attendees, it is the second-largest event in the IT services channel and continues to grow every year as more and more members come in to get their dose of "Vitamin R." Last year over 879 IT services firms attended; that does NOT include a count of vendors and other industry pros. This event is designed to bring together ALL of our clients, OLD and NEW, to share and collaborate on marketing, sales and business-building best practices. While you are not required to own a product to attend, the majority of the people who register own one or more of our products. Also, you are ENCOURAGED to come if you purchased a program years ago, but never fully implemented it; Boot Camp is the perfect event to get you re-focused and re-energized about growth, marketing and growing sales. Many of our clients also bring a spouse, business partner, marketing manager or salesperson so they can learn from the various sessions and network with other sales and marketing pros for fresh new ideas and take-home strategies. The PRIMARY sessions and speakers are listed on the event website here: www.robinsbigseminar.com/speakers.php. However, there will be dozens of additional breakout sessions, a cocktail reception meet-and-greet and a HUGE exhibit hall full of trusted vendors, suppliers and consultants who can help you implement the various marketing, sales and business-building strategies we teach. You will also benefit from the breakfast and lunch networking sessions with your peers. If after attending the ENTIRE Boot Camp, you are not thoroughly convinced that this event was worth every single penny of the tuition you paid and the time you invested, just hand in your materials and say, "This wasn't what I expected," before you leave, and I will refund 100% of your money – no hassles! And for your trouble, we'll ALSO refund your airfare and hotel up to $300 in addition to your registration. No, but you CAN purchase a VIRTUAL ticket, which will give you access to all the sessions LIVE via the member portal (Dashboard) as well as "on-demand" for you to watch later. NOTE: Everyone who purchases a physical seat will be given a FREE virtual pass as well to share with their spouse, business partner or employees back at the office. The last day to cancel and get a 100% refund is Feb 5th, 2019. If it's after that date, you'll be given a VIRTUAL seat and refunded the difference in the ticket price. That way you won't miss out on the content and sessions. It's the difference between watching a Super Bowl game or concert in PERSON versus on the TV; there are some things you just can't see, feel and hear as a remote attendee. You will also miss out on the various hallway conversations with peers (which are extremely valuable) and getting the discounts and tools offered in the Exhibit Hall from the various vendors who attend. However, IF virtual is your ONLY option, it's better by far than missing out altogether. For starters, if you're NOT implementing, that is precisely WHY you need to attend. Five of your peers – who are in the EXACT same business that you are in, dealing with the exact same time challenges, the same "difficult" marketplace, the same hiring and employee problems and the same competitive pressures – are going to stand onstage and give you the blueprints they used to add an AVERAGE of over HALF A MILLION dollars in sales last year, and talk about how they broke free of procrastination, negative beliefs and bad habits to focus on GROWTH. Can you seriously believe for a moment you won't gain some gold nugget you can take back and apply for more profitable gain in YOUR business from this ONE session? Can you possibly think this is something you should miss out on, particularly if you're not generating the sales and new clients you need and want? Of course, you'll be surrounded by HUNDREDS of similar peers who can encourage you and give you the direction you need to finally IMPLEMENT. Second, Boot Camp is my annual "state of the union" where I provide the most powerful NEW marketing and sales strategies that I've been working on for the year – so I can ASSURE you there will be fresh, new ideas that you've not heard before, do not know about and aren't using. There was a time in my life when I was homeless, legitimately poor, without the ability to even obtain credit. I have paid for groceries on credit cards, been buried under mountains of debt and know what it's like to live week to week, barely scraping by. So while I can certainly understand legitimate angst some may feel over the investment, obsessing over the "cost" of the ticket and travel, I can state with much confidence and from PERSONAL EXPERIENCE that this type of poverty thinking is standing in the way of your prosperity. Only the poor think in terms of "price" instead of "return" or "value." Hell, I'm GUARANTEEING your decision to attend, removing all the risk to you! What other investment will deliver THAT type of assurance that the money you put in will NOT be wasted or regretted later? You can't POSSIBLY believe that you could sit through this ENTIRE conference, with the sessions and speakers we have lined up for you, and NOT come away with MULTIPLE and immediate strategies you desperately NEED to get out of your broke state?!?!?! Here's what I can tell you with absolute certainty: Staying at home staring at your 4 walls won't provide answers to how to get rich; and the little money you save by not registering won't make or break your life either. "Most have a myopic perspective of their company and wake up every day to complete TASKS in their business, not on moving the business forward." As the saying goes, "Are you too busy earning a living to make any real money?" You cannot honestly believe that over the next several months you won't be faced with critical decisions, challenges AND opportunities where the skills, tools, templates and information you'll learn at Boot Camp on marketing, lead generation, negotiations, hiring and building teams of highly productive people won't come into play. There is always the temptation to say, "I'll just skip this year and go next year…when I'm not so busy…when hotels are cheaper…when money's not so tight…when I'm not in the middle of X, Y or Z…" but know this: PROCRASTINATION is the preferred choice of the POOR. Then please call my office direct at 1-615-790-5011 or send an e-mail to ask@technologymarketingtoolkit.com. "I'm so glad that I found Boot Camp. It was such a splurge for me the first time that I attended. The Boot Camp allowed me to dust off the Managed Services Blueprint that I hadn't really put in place and Boot Camp is where it all clicked and I finally got it." "Get out of your office. Get a different angle. It just changes everything. There's no risk at all with Robin's money-back guarantee. The worst thing that can happen is you change your business for the better." "The Vendors You Bring To Us Alone Are Worth It"
"Being at Boot Camp with all of the vendors that you bring in alone is worth it. You get to see new technologies and different vendors all at once. You can step outside the box and talk with others in your industry. I don't get to talk this way to others in my area that I consider competition. It makes a big difference. Invest the money, because you're investing in yourself!" "Must-Attend Event If You're Serious About Your IT Business"
"This will be my sixth Boot Camp! 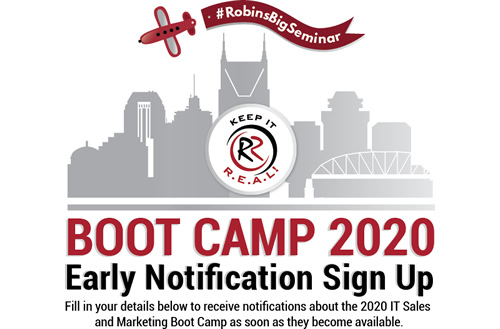 If you are serious about your business and want sane, sustainable growth in your IT business, you need to make it to Robin's IT Sales and Marketing Boot Camp." "Made Me Realize That I Don't Have To Reinvent The Wheel To Increase Sales"
"I did my first Boot Camp as a virtual attendee when it came to me as a bonus from one of my vendors. After watching that event I decided I needed to be in the room to see it live. You get to see and hear the speakers and meet vendors. But even more importantly, you get to meet and speak with SO MANY different people who are all over the country (and the world) and you get to hear their ideas and challenges and you get some good advice and ideas and then, finally, you realize that you're not alone and don't have to reinvent the wheel each and every time you want to try and make a sale." "You can't afford not to attend. 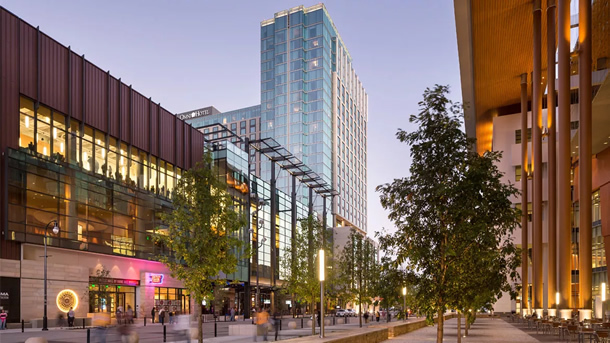 I seriously track return on investment for every IT conference that I go to every year, and with Boot Camp, I easily get a tenfold return every time." "I Could Have Left After The First Day And It Would Have Been Worth Every Penny I Paid"
"I drove all night to attend Boot Camp and it's exceeded my expectations. I came simply hoping that I would get something out of it that would be beneficial to me, but after the end of the first day I had so much information, so much knowledge, so many people to turn to, so many more pieces of the puzzle that I didn't even knew existed, that if I would have left after the first day it would've been worth every penny paid. This Boot Camp has really helped me get a clear understanding of what I need to do to transform my business. I would absolutely recommend Robin and her Boot Camp – and I'm not typically somebody that gushes or gives glowing recommendations; but the people that I have met and the information I've gained is leaving me speechless. Just the quality of the individuals that are here are truly mind-boggling." Greg Stier, Business Advantage Systems & Networks Inc.
"I'm absolutely thrilled with what I'm learning here at the Boot Camp. I've been in marketing and sales most of my life, but what this conference has given me is the direction, process and confidence to really implement it. Overall I've been extremely impressed with the level of professionalism and quality of content, and it's nice to hang out with my peers who have already been successful in implementing a working marketing plan for their business – you learn a lot from that. Now that we've got the marketing tools, there's nothing holding us back."